If you have never tried Moroccan food, then you are missing out on a whole world of culinary delights! 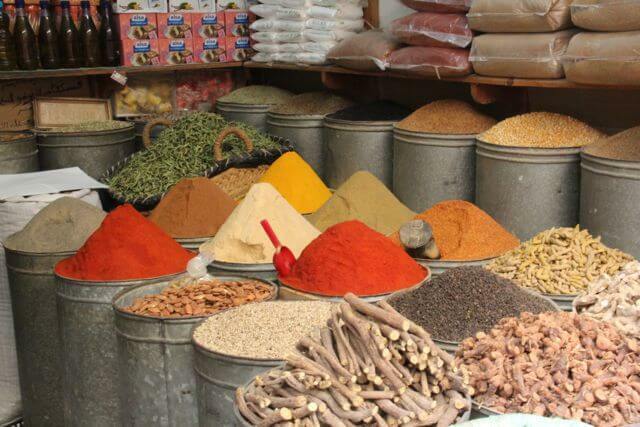 Moroccan food is full of flavor and spices. It makes you want to eat until you can’t possibly eat any more. From the first course of bread and salads to the main dish of delicious tagine, from the fresh fruit and Moroccan cookies for dessert to traditional sweet mint tea, a Moroccan meal is always a treat. There are many recipes for Moroccan food online, but the best way to learn to cook Moroccan food is by being taught by a local expert. 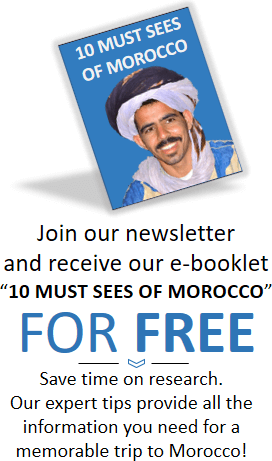 Do you want to learn to cook Moroccan cuisine? The popularity of cooking classes is high in this area of the world, with a number of different courses ready to open and awaken your senses. While some cooking classes are larger in size, there are also plenty of opportunities for one-on-one sessions, if you know where to look. Whether you are a beginner or an advanced chef, we can help you find just the right cooking class on your trip to Morocco. At Café Clock in Fes, students spend a day learning to prepare authentic Moroccan food, from planning the menu to the final preparations of the food. Café Clock and Chef Souad are well regarded for their culinary expertise and teaching. 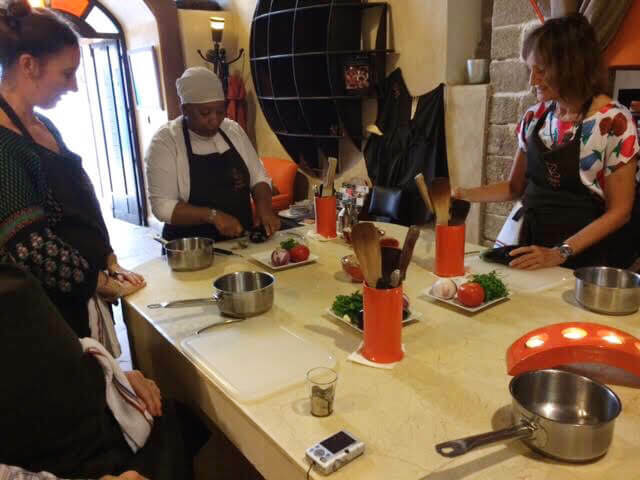 Taking a cooking class at Café Clock is one of the most popular activities to add to a tour in Fes. If you’re interested in adding this to your trip, make sure to plan ahead in order to get a spot! Your cooking adventure starts in the morning as you plan your own personal menu. You will take your list to the market place, where you will select the best vegetables and ingredients. A personal travelers tip? Make a mental note of the foods you select and think about how you could make this in your home country! When you get home you might be surprised by how much you can replicate in your very own kitchen! The local expert will then guide you through the preparation of the meal. By mid-afternoon, you have will have learned some of the time-honored Moroccan cooking techniques. Now for the best part: sitting back and enjoying your 3-course feast! We highly recommend this course, as you are able to experience all the steps that it takes to make a fantastic Moroccan meal. This riad, a traditional Moroccan guesthouse, accommodates guests over-night as well as for cooking classes. While guests staying at the riad get a discount on the classes, they’re open to the public. You have the options of taking a class or classes that last half a day, a whole day, or even multiple days, depending on what you’re looking for. If you’re interested in taking a trip to the local community bread oven or market to pick up fresh produce and ingredients, they often included in the lessons. Soon, with the help of their wonderful instructors, you can find yourself learning firsthand how to make delicious Moroccan salads, tagines, and pastries! 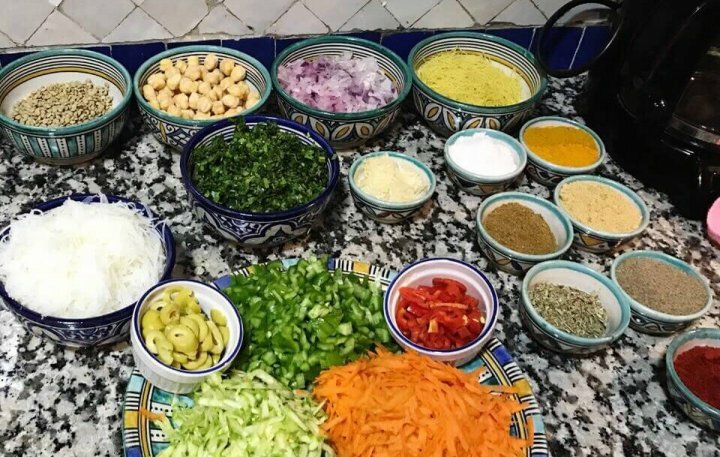 Located in the beautiful coastal city of Tangier, Tiffi’s Moroccan Cooking School offers personalized cooking classes for those who want to learn the secrets to Moroccan cuisine. The one-on-one instruction ensures that all of your questions are answered and that you walk away knowing far more than you came in with! The best way to learn how to cook is from an expert, which is exactly what you get with these cooking classes. You’ll get to enjoy what you create at the end of the lesson and have the opportunity to buy some of the school’s own spice blends. They also offer options if you’re interested in learning how to make traditional mint tea or henna. This family business calls the beach town of Essaouira home and loves welcome guests in to learn the tricks of Moroccan cooking! With all of the variety in seasoning, spices, and ingredients that go into local cuisine, it’s best learned by cooking alongside a seasoned chef. And Khadija is just the person! Since it’s based out of her family’s home, the lessons are a true lesson in the hospitality that Morocco is known for. In these informal but totally informative lessons, normally only 2 to 4 people, you will get to know the ins and outs of making some of Morocco’s main dishes. What’s really special about these cooking classes, is that they are specified to fit exactly what you want to learn! If you are concerned about dietary needs or restrictions, they are ready and willing to accommodate you. No need to worry, just get ready to eat! This eco-friendly Kasbah offers a whole array of classes and activities including bird-watching, pottery, language classes, and of course cooking classes! 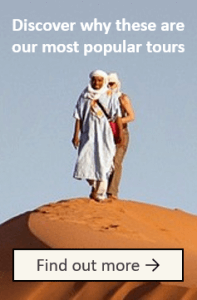 Because they are settled among the Berber community, the Ecolodge proudly embraces the history and traditions of the Berber people. 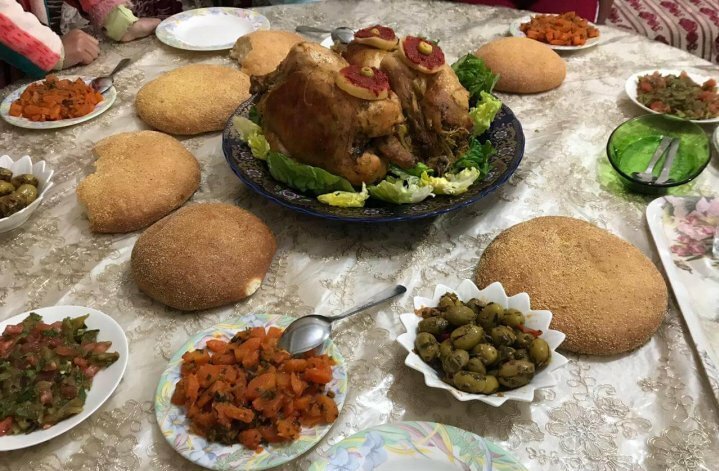 So, their cooking classes are given by a Berber chef who passes on this recipes in the oral tradition like they have been taught for generations within the community. You’ll get to make, taste, and enjoy incredibly yummy tajines, pastillas, traditional Moroccan bread, and more! This is a great hands-on way to learn some new skills for your kitchen back home while getting to know local culture even better through the world of food. You don’t need to be a hotel guest to enroll in one of the famous cooking workshops at La Maison Arabe in Marrakech. 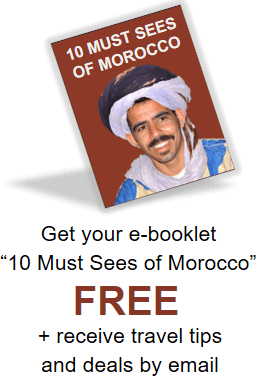 The half-day courses are taught by a dada, which is a traditional Moroccan chef. A translator for both English and French is also on hand to help lead you on an excursion to a nearby spice market. All participants in the La Maison Arabe cooking workshop have their own workstation, where they learn alongside the dada. They will walk your through the steps to make an appetizer and a main course, or a main course and a dessert. Since most Moroccan meals are incomplete without some bread, you will also get to visit the communal bread oven. And of course, at the end you get to enjoy the fruits of your labor! Small, large or private cooking classes are all available to suite your needs or desires. Tucked inside a luxury Marrakech hotel, Maison Mk offers two opportunities, both separate or private, for those hoping to learn to cook authentic Moroccan meals. The first option is a half-day course. They will take you on a walk through the Mellah market where you learn all about local ingredients and how to use them in your cooking. Here you will buy all the meat, fish, poultry, fruits and vegetables you need to construct your meal. 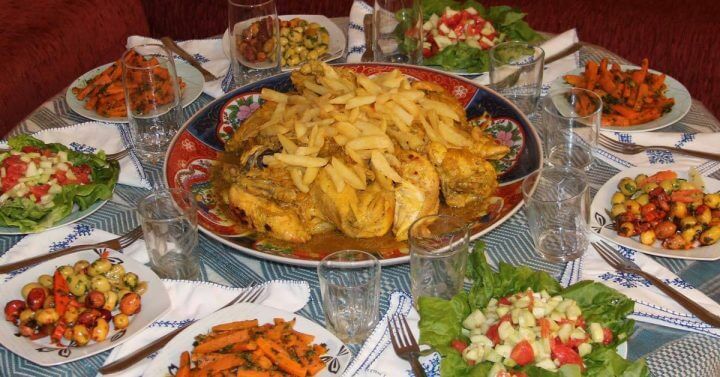 Then, you will learn to prepare tajine, mint tea, and authentic Moroccan salads. In learning about these three mainstays of Moroccan cuisine, you’ll get a better understanding of Moroccan culture as well! The other course option at Maison Mk is a half-day long, but includes only cooking. Instead of going to the market with your instructor, the chef has already made the selections for your meals and received the necessary ingredients. From the time freed up that would go towards doing the grocery shopping, you can learn additional Moroccan cooking skills. As you travel around Morocco, you realize just how important Moroccan bread is to the country! Every neighborhood in the old cities have a local wood-fired oven, and Maison Mk even has one of their own. To get this authentic taste of the heart of Morocco, they will teach you how to make this bread the traditional way in a communal, wood-fired oven. You may find it difficult to get a spot, though, as non-hotel guests are only admitted to a small number of cooking courses. Learn a few secrets about preparing authentic dishes, as you enter the elegant cooking class at Restaurant Riad Monceau in Marrakech. The restaurant offers both morning and afternoon sessions. The half-day workshops teach visitors how to prepare either a starter course and a main course, or a main course and dessert. Have you tried some of Morocco’s amazing pastries? If you’re curious about how to make these yummy desserts, this class could be the best option for you! These experts can teach you all the tricks of the trade so that you can make your own. At the end of the preparations, you will have time to taste and analyze your creations. If you do plan to sign up for a class, be sure to book way ahead of time. Classes fill quickly. If you not only want to learn to cook Moroccan food, but also give back to the community itself, consider Hakima’s Moroccan Cooking School. The goal of this culinary center is providing job training and literacy for Moroccan women and girls. They specialize in using local, fresh ingredients while focusing also on technique and presentation. Their cooking workshops and classes support the work they do in the community. Cooking class options include single or multi-day classes. You’ll take a trip together to the local market, seeing firsthand the beautiful fresh ingredients that make Moroccan food truly incredible. Your teachers will give you in depth explanations on where you’re cooking, their techniques, and step-by-step on how to prepare your meal! Classes are small and personal, capped at four to six students. The instructors offer classes in both English and French. Like Hakima’s Moroccan Cooking School, the Amal Centre is a non-profit organization who uses the power of cuisine to empower local women. Starting out in 2012 as the Amal Women’s Training Center, the center has grown into additionally having a full training center and restaurant as well as cooking classes for the public. The name “Amal” means “hope” in Arabic, which makes it a fitting name for this organization which aims to bring together practical skills and the spice of life. You’ll get to taste a whole array of different Moroccan dishes and learn how to make your own! At the end you get a recipe card to take home with you, a souvenir and a wonderful way to recreate the delicious magic of Morocco once you’ve returned home! When taking classes here, you get a taste of Moroccan culinary life as well as a taste of Morocco’s hope for the future. The pricing of these classes vary from $40 – $80 per person. Included in this pricing is the instruction, supplies, and ambiance. You will then enjoy eating your creations! How can I arrange a cooking class? For those of you who want to arrange the class on your own, you can contact any of the cooking classes directly, however, if you would like us to make the arrangements and prepay on your behalf, please ask your sales representative for help. It would be wise to check with your salesperson before booking, in case they have tips on how to make it best fit with your itinerary. Whether you choose a personal cooking session with individualized attention, or a large group setting at a five-star hotel, there is much to learn about cooking in Morocco. 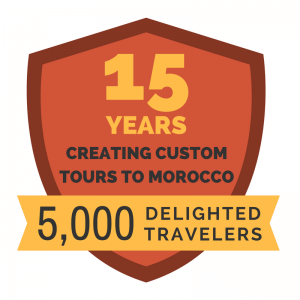 Contact our team today for more information on cooking classes or cooking tours in Morocco.